Howls of outrage from some quarters today, over Easyjet's very orange and new 'Malaga not Margate' advertisement; quite different to an earlier campaign. In my view, making a huge fuss and threatening to boycott the airline, only gives the company the attention it wanted in the first place. Perhaps if the new advert were displayed prominently outside Lunar House or the council offices in Croydon; the last stop for many, before catching the train to Margate with a one-way ticket from Bromley South station, £26.80, would readers feel any differently? Staying with photographs this morning, one of my readers sent-in this next newspaper cutting to share, on the importance of tax return accuracy. Some of us will of course be writing our balancing self-assessment cheques to HMRC this month and it's always encouraging to hear that they are still managing to get things so badly wrong that they consistently win awards for being the worst organisation in Britain to do business with. 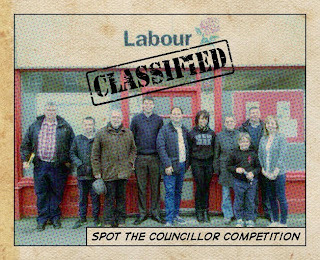 This last photograph today shows a stirring team photo of Labour out canvassing in Cliftonville over the weekend; clearly the county elections have started early, see my sidebar, anonymous poll, although I haven't seen any official news of Will Scobie as a candidate yet. I'm assuming the Party will use the same tactic from the recent Westgate by-election and make doorstep promises to reverse the coalition's benefits cuts to local residents who are vulnerable and naive enough to believe them. 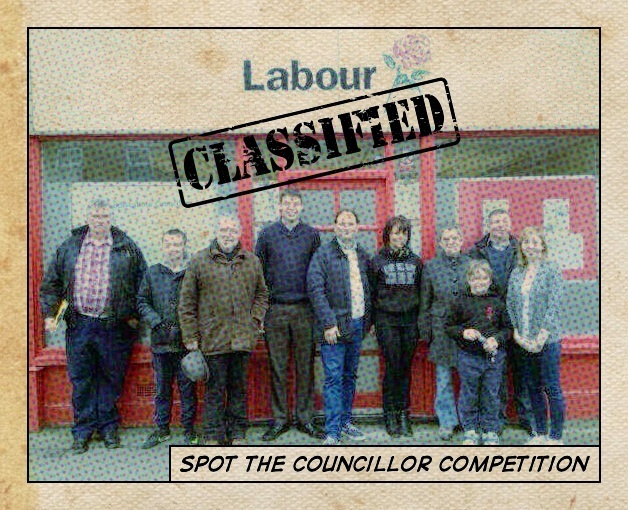 I notice the photo includes a lady who, rumour has it, may even be a district councillor for my own ward of Westgate on Sea. So now is a good time to remind local readers that it's the first Residents' Association (WWRA) meeting of the year, on Monday evening and with the by-election having taken place in May of last year, this might be an opportunity to meet some of the local people and tell them what good works she's been doing around Cliftonville for the last seven months, what plans exist to reverse those benefits cuts or indeed what's happening with plans for the building of a Tesco in the town. I'll be there. "The WWRA is 'Non-Political' and to those councillors and Political Parties who don't bother to turn up month after month . Please do not turn up to the WWRA meeting and think that they can use our meeting for canvassing and for votes, just because there is an election on this year. We had all that when we had the Westgate by-election last year and have never seen anyone since. We do keep a record of our councillors' attendances Tom King, Robert Burgess and yourself have outstanding attendance but the other three councillors you may as well ask who are they? As they hardly ever attend if at all. Lastly, on this morning's BBC Daily Politics Show, the Communities Secretary, Eric Pickles, confirmed that releasing EU immigration restrictions on Romania and Bulgaria at the end of this year, would introduce 29 million people to the privilege of settlement in Britain and not Malaga. Given the earlier fiasco with Poland in 2004 and pressed to give an estimate for the number that might come to settle, he declined to be drawn but the BBC's Andrew Neil offered an educated guess of at least 300,000 (plus any dependents); much more than all the new housing stock to be built over the coming term. Another reason perhaps for David Cameron to seek an urgent re-negotiation of our position as a member of the European Community. Talking of election promises, have you heard anything new about Labour's pledge during the Westgate by-election to convert Margate High Street into a community centre? I'd just like to point out Stellios doesn't run Easyjet anymore so your own idea of a poster doesn't work. 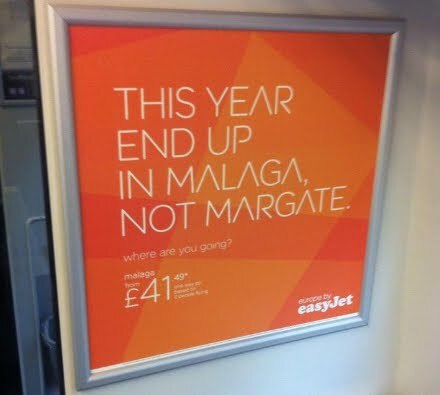 To be honest I think the Easyjet ad is spot on! Yes.. you'll notice the credit under the poster to @GBPizza for the design but that's not to say they didn't do a good job at short notice, regardless of Stelios being involved in Easyjet or not! Apologies to Stelios of course!